Well, today, September 13 was the day we had really hoped would be our planned C-section day to deliver our triplet girls. I knew that pre-term labor was a huge risk but I was following two other blogs of multiples and they all went even past the average gestational term for triplets (32 weeks). The moms were these small, petite women who didn't even go on bedrest. I was so confident that it would be the same for me. I felt strong, I was having tons of braxton hicks but that is normal for triplet pregnancies. 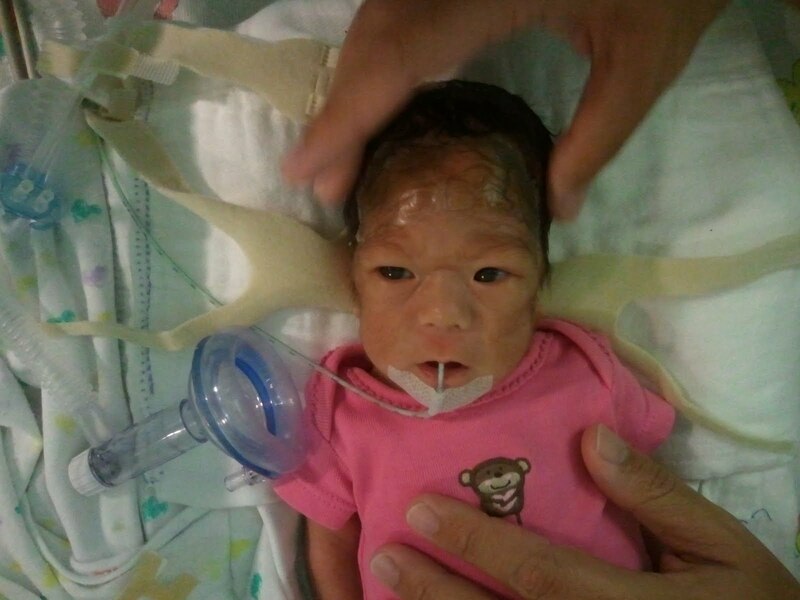 Casey's neighbor was born a few weeks later gestationally than Casey's 26 weeks. Privacy laws are strict so we're supposed to stay by our baby and not be privy to any info about other babies. But I find myself glancing over at his corner and marveling at how well he is doing. He's off his oxygen support, he is bigger. The nurses keep telling us you can't compare babies...but I just think how different our lives would be if our baby girls had just come 2 or 3 or 4 weeks later. Heck, even 2 days later so I could have had steroid shots to help their lungs develop. A few weeks and we might still have Allison here with us. I hate that a month difference robbed us of so much. The other part of me realizes that the fact that we even have Casey is amazing. 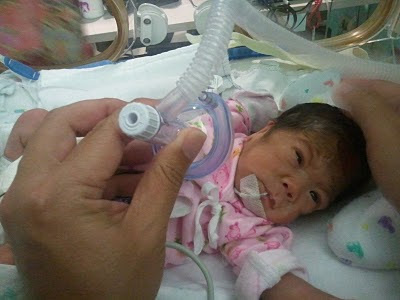 How all the medical advances and research have made it even possible for someone born at 26 weeks gestation to survive. That had this been maybe fifteen years ago, we wouldn't have our little Japanese princess. We live for the moments when Casey is awake. She's so alert. Her "touch" times are every three hours starting at midnight and around the clock. That's when her vitals are checked, her pamper changed, and her feeding time starts. Those are the times that she is often awakened, not too happily. She grunts her displeasure and flails her arms. Those are the times we try to aim to be by her bedside. As soon as her touch time is over, she's tucked in and she's back to sleep. Her sleep is essential for growth so we leave her alone, sometimes just sitting by her isolette playing on her phones or we'll kangaroo hold her while she sleeps. [Here we are at Casey's 6 pm touch time. On the left is Nurse Arlene and Scottie on the right. Arlene uses a mask that blows oxygen over Casey's face so we can remove her CPAP gear completely and give her little wrapped face a break. Scottie rubs her head to get the blood flowing, especially since Casey wears the CPAP mask 24 hours a day strapped to her face. With the pressure off her face, Casey has an easier time opening her eyes and will look around for a good chunk of time. It's awesome. She breathes really well off the CPAP but it's only for a short period of time. Most likely, if she's left to breathe completely on her own, her lungs will tire out and she'll start to experience oxygen saturation drops. She'll also be burning precious calories. Still, these brief bursts are perfect and give her lots of great practice at breathing by herself. -She's been gaining weight steadily. We haven't had a 'loss" day in over a week. -She had bloodwork and labs done this morning. Besides an elevated level of bilirubin (she may be getting jaundiced and need another stint of sunbathing under the lights), everything was normal. -for our family as a whole. We have good days, bad days, and worse days. Emotionally, this year has been a long struggle. Hooray for Casey's growth! She opens her eyes up so much more now. I thinks she knows when we're there. I'm sure she knows when you're there. It's amazing how those little ones can "smell" mommy and daddy. You guys are doing so well, Keao, I so feel your heart. Rest right there in His palm, because I know that's exactly where all three of you are! i love reading the updates! i love the pictures even more...look at her big beautiful eyes!! a little blessing all dressed in pink! I will continue to pray this week for your familys needs...also prayers for her doctors! How wonderful to see Miss Casey's eyes open and alert. And it looks like she's already quite the fashionista! Praying for you all...Stephanie Buchan forwarded this to me and I've weeped, and rejoiced, with you many times in the last 6 weeks. After losing our own daughter at 25 weeks and 3 days gestation, (born stillborn) many months went by before I could say, "Children are a blessing from the Lord." But now I proclaim it! The ones that breathe, the ones that don't, the ones that have ten toes and the ones that have none...Thank you for your updates and the beautiful pictures of Casey.